Undoubtedly the most professional method of attaching an oil pan is through the use of Milodon's pan stud kit, which includes heat-treated studs with rolled threads and special nuts with built-in serrated washer face. The kit provides easy pan installation, prolongs gasket life and the special serrated nuts guard against pan loosening during operation. Permits rapid valve cover installation and removal. Guides valve cover and gasket into position. 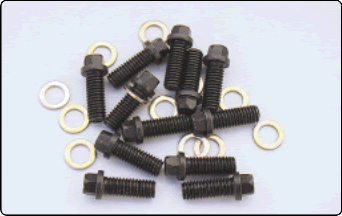 These studs are heat- treated and feature rolled threads and black oxided finish. Includes special serrated washer-faced nut. Designed especially for firmly holding oil pans in place and not loosening up. Features a built-in washer face with case- hardened serrations. The washer face and small head permits the use of a socket wrench for quick and accurate installation. Construction is such that they can be re-used time and time again. Same as Milodon's pan bolts. The washer face and small head permits the use of a socket wrench for quick and accurate installation. 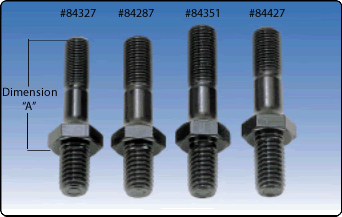 Milodon's rocker arm stud kits are premium race quality fasteners. Manufactured from tough 8740 steel, they feature a large ground radius fillet to provide increased support to the stud shank, effectively eliminating bending and subsequent breakage. All Milodon studs are precision machined with rolled threads and heat-treated for strength of 190,000 PSI. The complete stud has a black oxide finish, and each kit contains 16 studs. These premium quality 190,000 PSI crank bolts are made in one piece from billet 8740 steel, using rolled threads after heat-treat to aircraft quality specs. The washers are 4130 steel which is heat-treated and parallel ground for flatness, producing even load distribution. Compact 3/8" hex head bolt allows use of standard non 12 point socket wrench yet is easy to work with in tight quarters. These heat-treated intake bolts come complete with washers. These high quality carb studs feature premium quality rolled threads, Milodon innovated "starter nose" to ease thread s tarting and vibration-proof locking washer faced nuts . Studs are black oxided and nuts are silver. 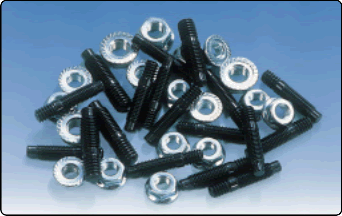 Hardened, parrallel ground head bolt washers properly spread the bolts ' loads evenly on the head as well as promotes accurate, even bolt torques. Specially designed to firmly hold timing cover in place, features a built-in washer face with case-hardened serrations. The washer face and small head permits the use of a socket wrench for quick and accurate installation. Construction is such that they can be re-used time and time again. Fits small and big block Chevy. These thread rolled, thread starter nosed studs make installing headers a snap. The studs align the gasket and header flange allowing the header to slip on without the usual hassle, crossed threads and wasted time. Includes small 3/8" hex nuts for easy access. A neccessary componemt for any seroius engine buildup. A balancer that isn't properly att ached is not only dangerous but will not do it's job of protecting the crank bearings properly. Grade 8, heat-treated and thread rolled steel in a gold irridited finish. Bolt features a 3/4" head for easy torquing and engine turning by hand. Set includes bolt, lock washer and 1/4" thick flat washer. 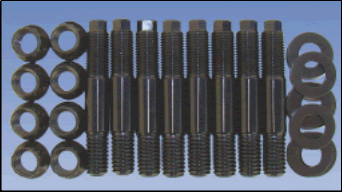 Grade 8, heat-treated header bolts. Compact 3/8" hex head bolt allows use of standard non 12 point socket wrench yet is easy to work with between header tubes.Bolt flange is still large enough not to pull through slotted header flanges unlike many others. Milodon aluminum blower studs and aluminum nuts are designed to permit blower and manifold seperation during unexpected blower explosions without causing damage to the manifold and blower housing, which would otherwise occur. 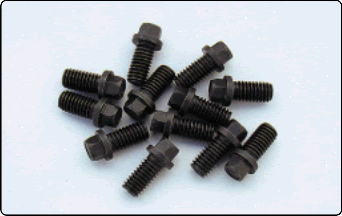 Our studs are used by professional racers in top Fuel, Funny Car and Alcohol classes and are recommended for all supercharged appllications. Fits 4.71, 6.71, 8.71, 10.71, 12.71, 14.71 GM superchargers.